October 18, 2015 — Sixty-one years ago Lucille Ball and husband Desi Arnaz made a film called The Long, Long Trailer. 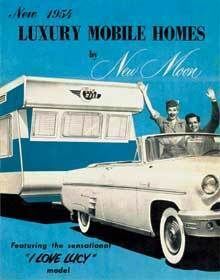 A typical Lucy adventure, the couple lived in a large trailer pulled by a convertible. Lucy nearly backs over a cliff, Desi saves her. Lucy cooks while Desi drives in the mountains. All their possessions slide back and forth as the road twists and bends. It’s laugh out loud hilarity, and typical Lucy. Born moved to a large Washington Heights apartment which was “massive with formal dining room, long corridor, double parlor, and French doors.” Eventually, that apartment became too expensive, and Born moved to her present apartment in the South Bronx. As her children moved out, Born realized she did not need all the space. “One of my daughters has a big studio in Manhattan and has everything she needs,” she said. This epiphany led her to television shows about the movement, such as Tiny House Nation, Tiny House Builders, and Tiny House Big Living. The Kondo book may have contributed to Born’s desire to rid herself of stuff and move to a smaller space. On her blog The Backpack Press, Born started a 40 bag challenge February 2015. For forty days, she vowed to take a bag of unwanted “stuff” out of her apartment. Forty days later, she was transformed by her Lenten experience, and finds herself still thinking about her stuff. “It is amazing how you come to understand about you and your stuff, and how it defines you, ” Born said. “When you look at your stuff, you are really looking at yourself. “You know how when you see sad people standing in front the wreckage of their burned home and they say, ‘At least everybody got out,’ but they are still sobbing. Losing your stuff like that is like looking in a mirror and seeing no reflection. Born explained that getting rid of her possessions has been a gradual process, but she is happy that she doesn’t need a closet to house things she hasn’t used in 15 years. She kept some things, and let others go. “What does it say about you that these are the things you keep?” Born also mentioned that many seniors struggle with adult children who don’t ascribe weight and value to long-term family possessions. Born’s new digs are ironically in the same building she’s lived for five years. She’s ten minutes from Manhattan, via a walk across the Macombs Dam Bridge. The new apartment is two floors lower than her present home, and overlooks a garden. Born, a veteran traveler, had no intention of being held hostage by her stuff. “I want to spend money on plane tickets,” she said. “This is absolutely core and fundamental. The bottom line is not a get-rich quick scheme to drop my cost of living. I want to be able to afford my own life. Having lived in the same Brady Bunch era house for twenty years, I’m in the beginning stages of thinking about a smaller place to live. While I don’t live in a McMansion, our mid-western middle class house has no mortgage. The dilemma comes when wanting to purchase something nicer, newer, and with less maintenance. That may cost more unless we’re ready to move into smaller space. Our tiny house would have to have two tiny offices, two tiny bathrooms, and a room for the cat-box. Nor would a mobile house suit us. We have difficulty finding St. Louis from our house, let alone driving cross country with a two-ton anchor. As the family historian, I worry about where the family treasures will land. My son, who lives in a studio apartment in Washington, D.C., probably doesn’t want the early twentieth century Victrola his great-great-grandparents owned. This movement does have me thinking. It’s probably time to get rid of my wedding dress. I haven’t worn it for more than thirty years, and I don’t have a daughter. One of our local hospitals “recycles” wedding dresses. It rests on the top shelf of my walk-in closet, high above other things I do not use. Time for a change.